With the first week of 2012 underway, a temperature roller coaster has been the highlight in Mid-South weather so far. An arctic front brought frigid temperatures to the area with readings dipping into the teens in suburbs and outlying areas on Tuesday morning, but the Mid-South has quickly settled back into a milder pattern as 60s made a return this afternoon. That milder weather looks to continue for a few more days, but along with that will be the first rain chances of the new year, and more Arctic air may not be far behind either. The nice weather looks to peak tomorrow afternoon as high temperatures climb into the mid to upper 60s, nearly 20 degrees above average. Clouds will be increasing as the latest cold front begins to approach, but dry conditions should prevail. Rain chances begin by evening though as a few light showers may begin developing. As the cold front crosses the metro during the day Saturday, chances for light rain continue. Fortunately, moisture over the area will be limited, so it will be far from a wash-out. The cold front won’t have much cold air associated with it either, so while temperatures will cool some Saturday night into Sunday, they’ll still remain a bit above average. NWS forecast map for Saturday morning shows a cold front as it moves through the metro area. Following the cold front’s passage through the metro, models begin to diverge on a possible stall of the boundary just south of the area, complicating the forecast through the early part of next week. 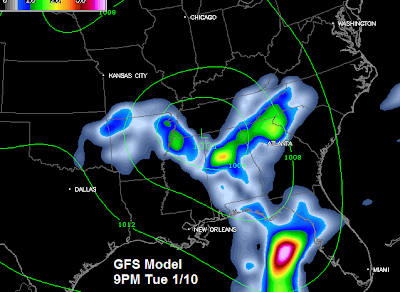 Some models show the front stalling just south of the area, which may keep low rain chances in the area through Sunday or early Monday, though any amounts would continue to be on the light side. 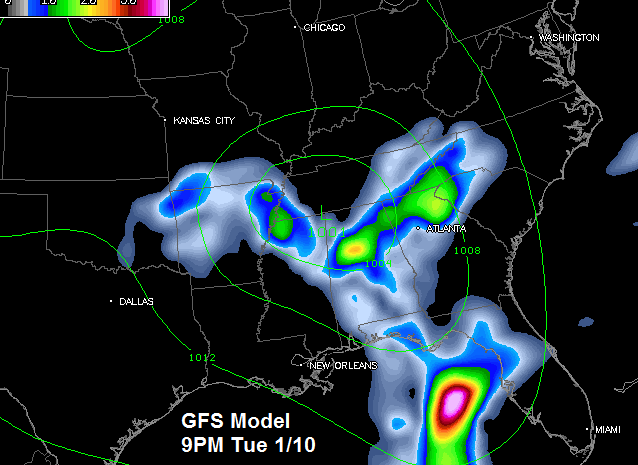 GFS model forecast for Tuesday evening depicts low pressure tracking northeast through the area. Regardless of where the front stalls early in the week, the overall weather pattern will begin to shift mid-week as new low pressure develops to our southwest Tuesday into Wednesday. This low pressure area will track northeast through the area, and rain looks to be a good bet, with amounts potentially more significant this go-around. Meanwhile, as the low sweeps past the area Thursday, a new arctic front will be fast approaching, and our next cold snap looks to be behind it. The first effects are likely to be felt Thursday as high temperatures fall back into the 40s, but some model indications show even colder weather may come by next weekend. At this point, details are still sketchy, but you can bet we’ll keep you up-to-date on MemphisWeather.Net as the forecast evolves over the next several days! Dippin’ Dots snow? Nope - that was graupel!